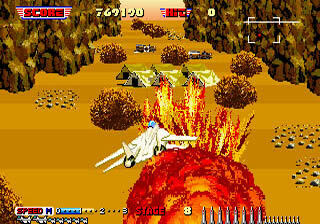 After Burner Complete is a port of the Arcade game After Burner II which was originally released in 1987. There's 23 stages and your mission is to destroy two communication booster stations which are located deep in enemy territory. Piloting an SSF-14 you can fire two Vulcan guns (unlimited ammo) but you also have guided missiles (limited to 50) that lock onto rogue planes. You're also able to speed up / down and if you have a six-button controller there's a roll manoeuvre to protect the rear. The action is hectic with explosion and missile effects everywhere and it's difficult to make out exactly what's happening on screen; as a result you'll be hit many times by enemy missiles that you couldn't even see coming. This forces you to swerve all over the place to try and avoid projectiles but the camera is disorientating as it shifts the perspective constantly depending on how your plane is positioned. Personally, I found the Vulcan guns to be pointless as the missiles are much more effective. Given how tough the game is there are checkpoints that let you continue from the same level if you manage to reach stages 5, 9, 13, or 19. Although the action doesn't really change throughout there's a bit of variety in the form of Stages 8 and 17 where you navigate through an claustrophobic canyon while avoiding the sides; there's no enemies to fight here and it's fun manoeuvring your way through and destroying the towers. I also enjoyed how the stages transition to different settings including forest, desert, night, to above the clouds and there's also some great cut-scenes, especially when you land on the runway to refuel. Although the scaling effects and scrolling are a bit choppy they do still look impressive. After Burner Complete is a great port of the Arcade original and for the time it was probably the best home version available. However, for me, the gameplay just isn't strong enough with erratic movements replacing precision, and a brutally tough difficulty which ultimately leaves you with a frustrating and empty experience. Random trivia: If you look closely you'll see the infamous Ferrari Testarossa Spider car from Outrun (1986, Arcades) appear on the runway in Stage 13!